Place whipping cream and espresso granules in a bowl; stir with a whisk until soft peaks form. Cut each banana half in half lengthwise. Place 2 banana quarters in each of 2 bowls. 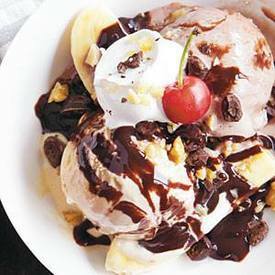 Top each serving with 1/4 cup coffee ice cream and 1/4 cup chocolate ice cream. Drizzle each serving with 2 teaspoons chocolate syrup, and top with half of whipped cream mixture. Sprinkle each serving with 2 teaspoons walnuts and 2 teaspoons espresso beans, and top with 1 cherry.